5/5. Great budget guest house. Myself and my partner stayed the night in this guest house. We had been travelling all night from Norfolk so all we wanted to do was go to sleep so when arriving at Annies they made our room up and let us in straight away. When we got in the room it was lovely and basic and very clean. They even gave us the family room even thou there was two of us! 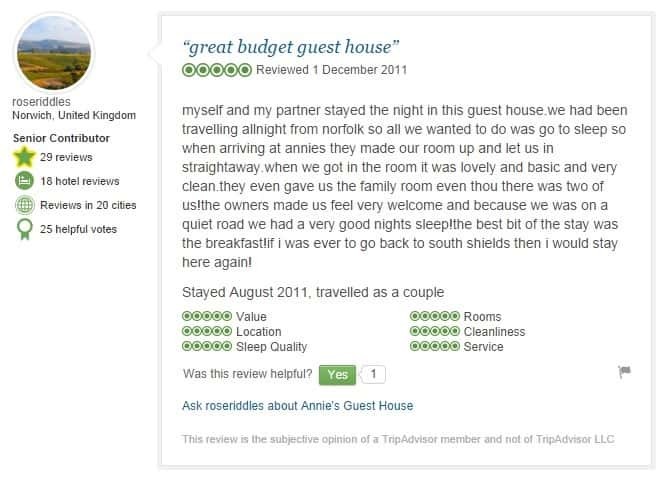 The owners made us feel very welcome and because we was on a quiet road we had a very good nights sleep! The best bit of the stay was the breakfast! 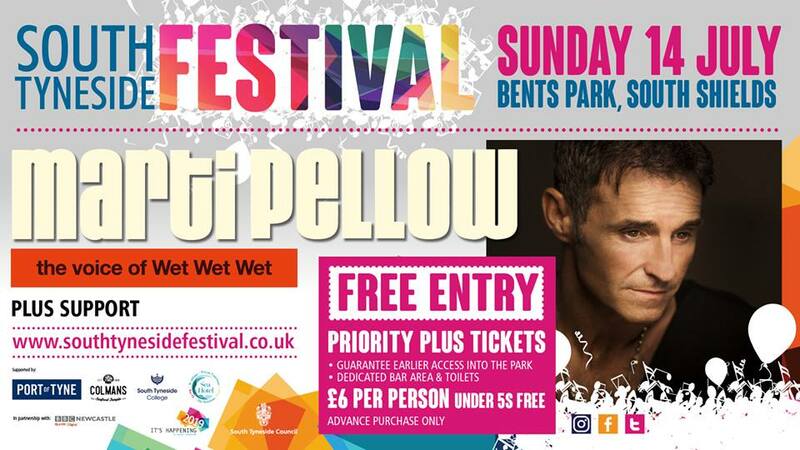 If I was ever to go back to South Shields then I would stay here again! 4/5. Great Digs.... Stayed in Annie's for nearly five weeks whilst studying at South Tyneside College as the Halls of Residence was full of Cadets! :-( During this time I couldn't fault it. 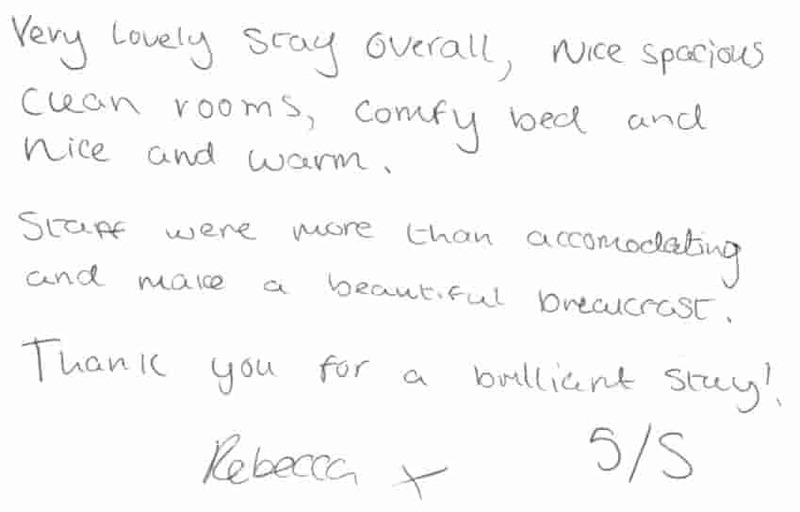 My room was cleaned every day, the shared bathroom and toilets were in great condition and when I had time to eat breakfast it was excellent. It was possible to get a weeks laundry done on the same day for about £5 or £6 which was one less thing I had to worry about while I was at the college. My wife joined me at various times during my studies and Linda was very helpful at letting me chop and change rooms to accommodate this. 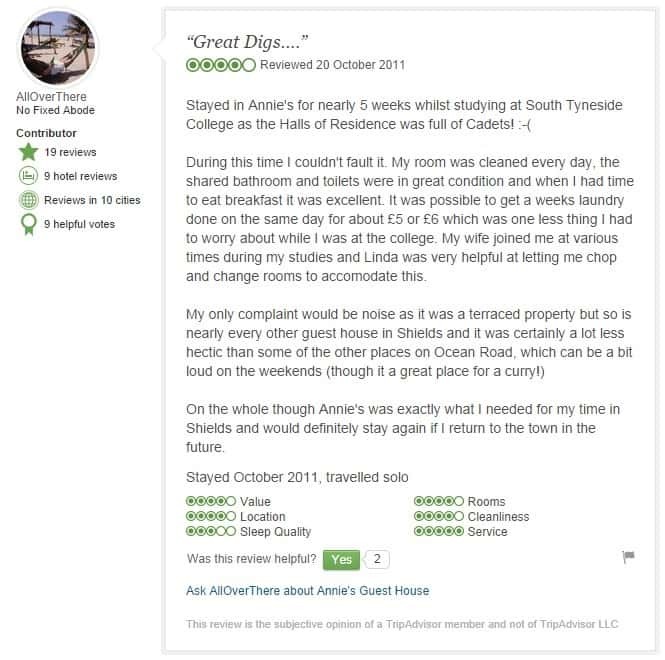 My only complaint would be noise as it was a terraced property but so is nearly every other guest house in Shields and it was certainly a lot less hectic than some of the other places on Ocean Road, which can be a bit loud on the weekends (though it a great place for a curry!) On the whole though Annie's was exactly what I needed for my time in Shields and would definitely stay again if I return to the town in the future. 5/5. One of the very best. Stayed for one night, the room was superb, very comfortable, everything you needed was available. The breakfast was first class, would definately go again. 5/5. A little gem. 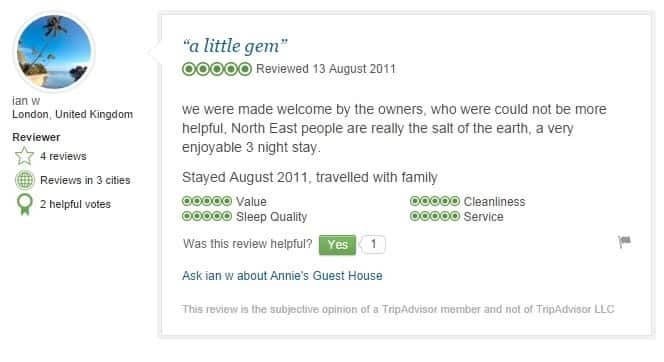 We were made welcome by the owners, who were could not be more helpful, North East people are really the salt of the Earth, a very enjoyable three night stay. 5/5. Comfortable, good location, good price! I stayed here for two nights, 29-31 May 2011, in a single room. Upon arrival, my friend and I were checked in by Linda who was very informative about local transport, as my friend and I were in the area to attend a concert in Sunderland. My single room was very comfy... a nice comfy bed (memory foam mattress), with heating, a flatscreen tv with plenty of channels, own kettle and hairdryer, black out blind at the window, tea and coffee supplies (even though I don't drink tea and coffee) and a basin. There is a shared bathroom which consists of a bath and separate shower in the access, and you are given a password upon check-in. A big thank you to Linda for all of her help and information! 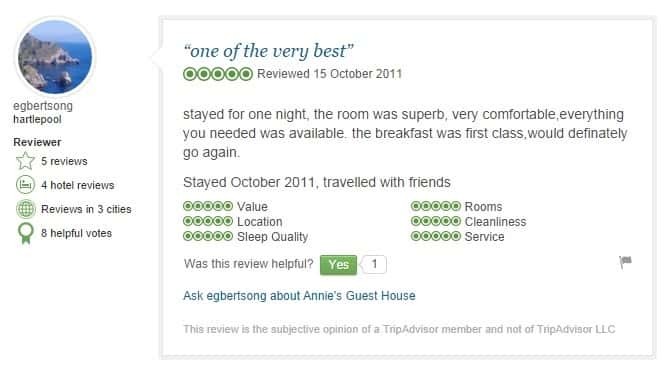 If I was to be in the area again, then I would return to Annie's Guest House (subject to availability). Room Tip Book directly with their website. 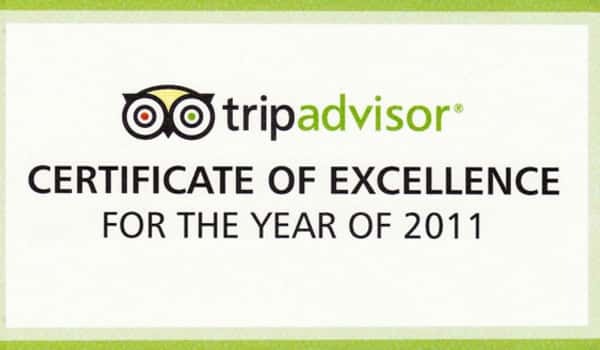 TripAdvisor Certificate Of Excellence 2011. 5/5. Excellent hospitality, made welcome by June and Linda, every needs met. We was made very welcome on arrival. Linda showed us to our room, and gave us a map of the town, detailing the shops, eateries and directions very clearly. 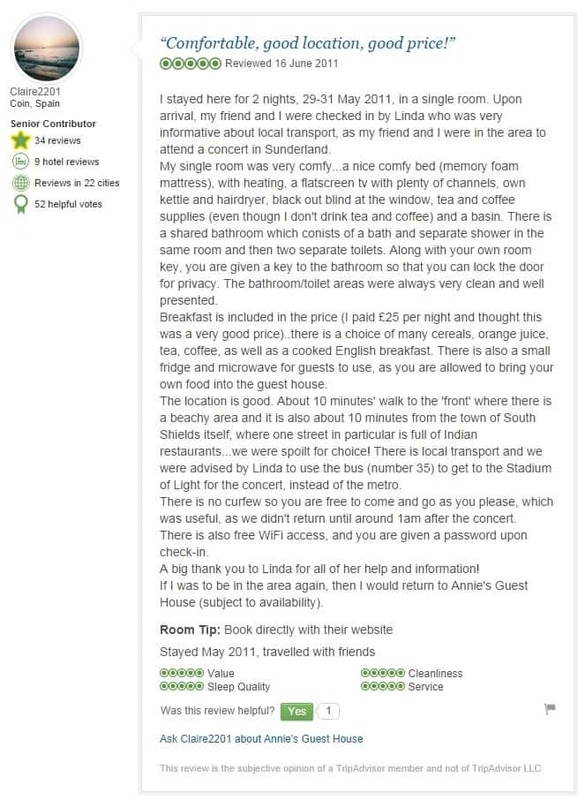 The room was very clean and the food was excellent.. we will definately be returning.